When we eat, only a portion of the calories consumed becomes available for our bodies to ‘burn’ for energy, or to store for later use. That’s because some of these calories will be lost along the way. For example, say you eat a food with 100 calories’ worth of carbs, fat, and protein. During absorption in your intestinal tract, 80 calories get taken up into your body and 20 get excreted (this can occur through the excretion of fiber or partially undigested foods). Furthermore, the process for your body to digest, absorb, and metabolize these calories also takes energy (called the thermic effect of food, which will vary depending on macronutrient composition). So let’s say your body expends 10 calories for all this. That leaves your body with a net caloric intake of 70 calories to use. But are there foods which provide fewer calories than it takes to digest them? A simple equation dictates available calories: The number of calories you consume − calories excreted − the thermic effect of food = net calories available to your body for use. 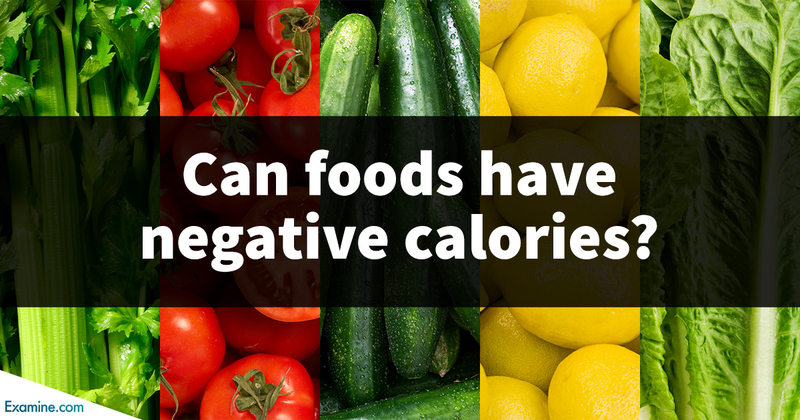 What is a ‘negative calorie’ food? The hypothesis behind negative calorie foods proposes that, for certain food items, the energy required for your body to process them is greater than the energy the food itself provides. Theoretically, the end result would be a food that creates a caloric deficit after consumption — thus aiding in weight loss. Not much evidence exists on the topic of negative calorie foods. One small trial investigated the effects of celery — often referenced as the ultimate negative calorie food due to its low net calorie content, providing just 16 kcals per 100 g. The study took fifteen healthy female volunteers (average age ≈23) and measured their resting metabolic rate (RMR) before and after consuming 100 g of celery. Of the 16 kcal provided by the celery, only 2.24 kcal were absorbed. So while celery isn’t a negative calorie food, its high water and fiber content can make it a desirable aid for weight loss or maintenance. The common claim about negative calorie foods is that the number of calories they provide are fewer than the number of calories needed for your body to process them, causing a caloric deficit. Neither our current understanding of human metabolism nor clinical trials support this claim. Some compounds found in foods have evidence for increasing your metabolism; either in intervention studies (synephrine and naringenin from grapefruit) or in theory (higenamine from Nandina fruit). Is it possible that these bioactive compounds could enhance metabolic rate enough to cause a caloric deficit? The reality is that for supplements that do increase metabolism, like caffeine, the increase is usually quite negligible. A supplement that helps burn an extra 10 kcal is not going to make a meaningful dent in the bigger picture of weight loss. One potent exception is DNP, (2,4-dinitrophenol). While not found in food, this supplement has been shown to potently increase metabolic rate. It creates a ‘leak’ in your energy pathways so that everything you do, from exercising down to breathing, burns more calories (as heat). However, this compound cannot be legally sold as a food supplement because the effective dose and the lethal dose are very close, and also varies between individuals. Since our bodies all react differently, and since the line between the efficacy and lethality of DNP is thin, what was safe for your friend may not be safe for you. At any dose, taking DNP is very much like playing Russian roulette. Of the supplements that might increase your metabolic rate, the effect is short-lived and minor. DNP, while effective, carries an extremely high-risk profile and is not legally allowed to be sold as a supplement. You should not use DNP. It is safe to say that the concept of foods with negative calories is not supported by the evidence. The thermic effect of food (how much energy is required to digest a food) is greatly tied to the caloric content, with more energy being required to digest more calories. Regardless of how little calories a food contributes it is implausible to be burning more calories than the food provides. A possible benefit of 'negative calorie' foods is that they also tend to be high in water or fiber (celery, tomatoes, and lettuce are common examples). Thus, these foods are likely more filling, which could results in you eating less. This decreased consumption would then lead to weight loss. There is no evidence that a food can possess negative calories, thereby directly contributing to with weight loss. But foods typically categorized as ‘negative calorie’ items tend to be high in water and fiber, so their consumption may lead to weight loss because you consume less food overall. Lemon water: is it good for you?